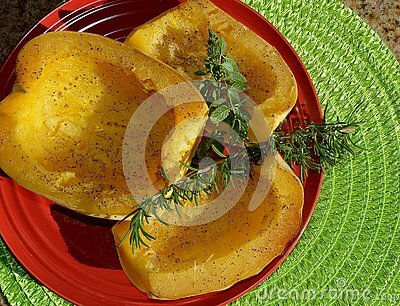 Spaghetti squash or vegetable spaghetti, is a group of cultivars of Cucurbita pepo. Found in a variety of shapes, sizes, and colors, including ivory, yellow and orange, with orange having the highest amount of carotene. Center contains many large seeds. Raw, the flesh is solid and similar to other raw squash. Salt and pepper with garnish of garden grown Peppermint, Mentha Ãâ Piperita, and Rosemary, Rosmarinus officinalis.